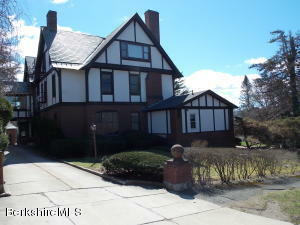 Grand Tudor Mansion, turn of the century condo.First floor unit overlooking landscaped grounds. Great interior space features hardwoods, ornate moldings , mahogany built-ins, high ceilings, two fireplaces and spacious year round sun room . Newer Kitchen w/ large eating area and fireplace. A must see. A true value for this remarkable, one of a kind offering.